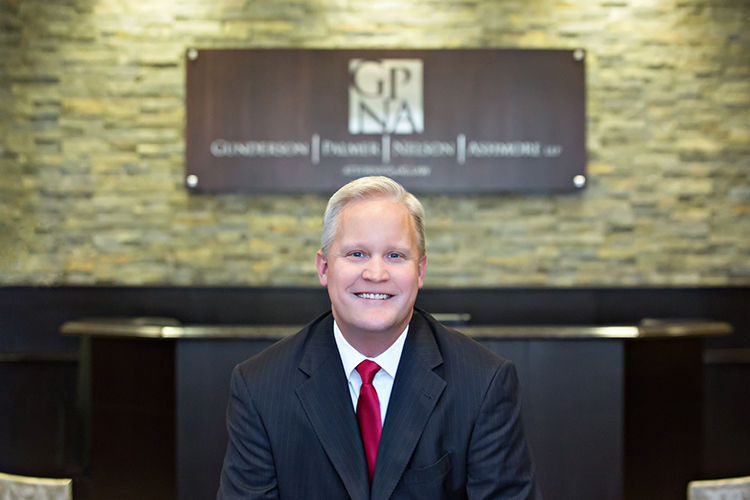 Jason Smiley is a partner of Gunderson Palmer Nelson Ashmore, LLP and a member of the firm’s Executive Committee. He focuses his practice on Construction Law, Real Estate, and Civil Litigation. Jason understands that each client’s concerns and objectives are unique. He enjoys the opportunity to represent clients that are working to make our world a better and more interesting place. As counsel for the Associated General Contractors of South Dakota, Jason provides legal assistance to the largest commercial contractor group in South Dakota. Jason’s Construction Law practice includes representation related to construction defects, surety bonds (Miller Act), breach of contract claims, extra work, change of conditions, and mechanic’s liens. Jason’s Real Estate transactional work includes all aspects of real estate development and construction, including title work, purchase documentation, planning and zoning, construction contracts, financing, and other related matters. Jason’s broad background in Civil Ligation makes him well qualified to assist clients in difficult situations. He has represented clients on a wide range of complex issues, earning him an AV rating from Martindale Hubbell. Jason is a member of The State Bar of South Dakota (Bar Commissioner 2010 – 2013), the South Dakota Trial Lawyers Association, the South Dakota Defense Lawyers Association (Member of the Board of Directors 2013-2015), the Wyoming State Bar, the Wyoming Trial Lawyers Association, and the Nebraska State Bar. Jason is a graduate of Black Hills State University and earned his Juris Doctor from the University of Wyoming. Jason was awarded the Outstanding Trial Student and the Defender's Aid Program's Outstanding Student while in law school and worked as a law clerk after law school for the Fourth Judicial Circuit in South Dakota. Married to wife Darby, they are the proud parents of two children. Jason enjoys skiing, pheasant hunting, fishing, golfing, hiking, reading and any opportunity to vacation by the sea. Representation of condominium owners’ association regarding construction defect claims related to water intrusion into the building envelope. Representation of municipal government involving claims by home owners’ association concerning improper road construction in residential subdivision. Representation of general contractor involving claims by a governmental district related to allegedly defective water well. Representation of general contractor regarding mechanic’s lien foreclosure related to water well project. Representation of subcontractor regarding claims by owner concerning allegedly defective retaining wall. Representation of general contractor regarding mechanic’s lien foreclosure related to road construction of a residential subdivision. Representation of subcontractor regarding claims of allegedly improper soil compaction of hotel foundation. Representation of subcontractor regarding construction defect claims related to water intrusion into the building envelope. Representation of contractor regarding termination of retaining wall project and claims for unpaid work. Representation of contractor regarding Miller Act Claims. Representation of subcontractor regarding allegedly improper roof installation. Representation of apartment complex owner regarding construction defect claims and claims for nonpayment. Representation of Fortune 500 company regarding land use dispute. Representation of bank concerning claims of lender liability in relation to a large agricultural operation. Representation of bank concerning claims against a credit union involving improper acceptance of financial instruments. Representation of credit union regarding foreclosure of commercial properties in excess of a million dollars. Representation of creditor in foreclosure of large agricultural operation. Representation of debtor in foreclosure of assisted living center. Representation of engineering firm related to project development costs for an ethanol plant. Representation of engineering firm related to dispute with shareholder. Representation of lender regarding more than one hundred mortgage foreclosures. Representation of insurance company on multiple cases regarding claims of bad faith and first-party insurance. Representation of general contractor regarding insurance coverage dispute related to allegedly defective construction. Representation of residential subdivision developer regarding insurance coverage dispute involving claims of expansive soil in a residential subdivision.